The spanking is right there on the menu. Across the bridge, Metro Crepes in Oakland's City Center has been steadily gaining notoriety for its last item on the dessert menu. The lunch time hot spot, of sort, seves a special crepe called the Las Vegas crepe, which costs a whoping $25. But the Las Vegas crepe is not just any crepe. 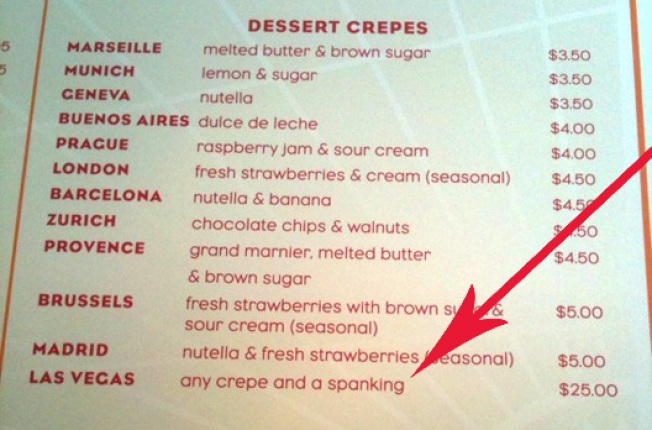 This lovely lunctime item allows you to order any crepe on the menu and get a spanking on the side. Yes, a spanking. Some added color from our tipster: "I didn't have the guts to order the 'Las Vegas' crepe ... When I asked about it, the cashier said, 'We do it right here!'" Oh, Oakland. As for their crepes they aren't amazing but they aren't have bad. We have no first hand knowledge on the quality of the spankings however.